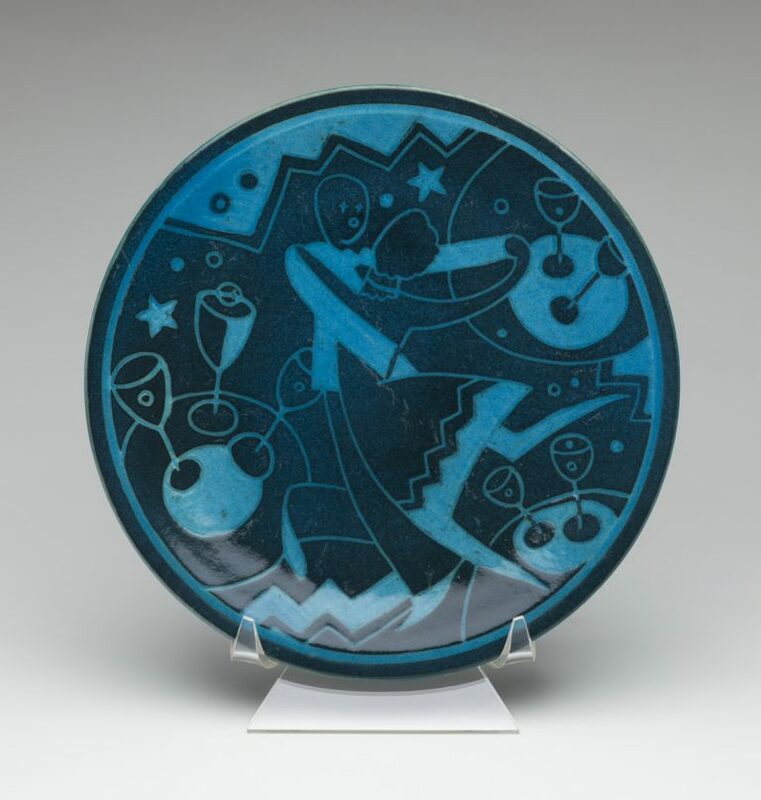 The popularity of Viktor Schreckengost’s jazz bowls depicting a night out in Jazz-Age New York led him to expand the series with several related designs, including this Danse Moderne plate. Schreckengost reprises some of the jazz bowl’s motifs in this plate, incorporating stars and bubbles that waft from the cocktail glasses, as well as a drunken man with Xs for eyes. The stylized dancing couple gives a sense of movement and dynamism to the piece. The Danse Moderne plate’s decoration was created through the process of sgraffito: the artisan used a stencil to scratch a design through the pottery’s black coating, then glazed it with cobalt to reveal a blue design on a black surface. The scratch marks give the blue surfaces a rough sketchiness that distinguishes Schreckengost’s Art Deco from the French style, which relies on immaculate surfaces. Only 10 of these plates are known to exist. All are in private collections except for one in the Ohio Historical Society and ours.